I’ve been using KR Multicase boxes and cases to store my models for the last two years. KR Multicase uses a system with hard cardboard boxes to store the trays. These cardboard boxes and trays then insert into the various soft carrying cases. I really like this system as I can store my models in the cardboard boxes and then just load the box I need into my carrying case. The cardboard boxes are very sturdy. None of mine are showing any damage or wear so far. A single cardboard case holds 6 half trays of “3” depth trays. The cardboard boxes are very easy to store. KR Multicase uses softer foam then companies like Battlefoam. They have custom cut trays for many different gaming systems but do not have custom foam for Flames of War yet. Most Flames of War models fit well into the standard trays (more on that below). It would be nice to have custom foam for some of the larger and awkwardly shaped models like King Tigers and airplanes. “3” depth trays are deep enough for medium tanks and things and seem a good compromise for Flames of War. F3H-18 compartments per half tray. Good for storing medium bases (standard infantry), small bases, small vehicles (Stuarts, carriers, etc). Can store a large base when two compartments are combined. King Tiger hulls can fit in two compartments combined together. N3H-20 compartments per half tray. Good for storing small bases, small vehicles, medium bases on their sides (F3H is better). Can store a large base when two compartments are combined. I think this is the best size for pieces on large bases (ex. artillery platoon). V3H-12 pick and pluck compartments per half tray. Good for storing medium vehicles like Shermans, Fireflys, Panzer IVs, T-34s, half-tracks, etc. I use little off cuts of foam to ensure they don’t move around in the trays and to protect the barrels. Panthers fit, but are a bit tight. D3H-10 pick and pluck compartments per half tray. Good for storing larger and wide vehicles such as Panthers, Tigers, StuGs, etc. To carry my models in, I have a Kaiser 1 case in black. I really like the case as it has enough room for my templates, rulebook, tape measures, dice, army lists, etc. It has a large pocket in the back for books and things. 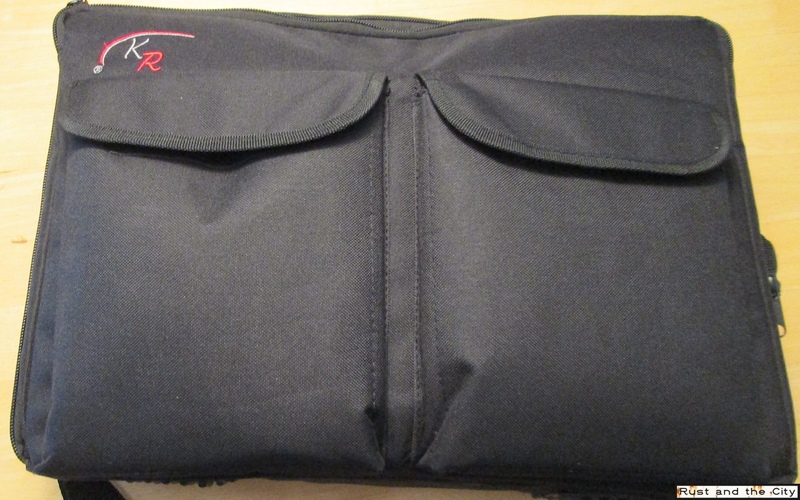 The front has a large compartment for books and two small pockets on the front for dice and things. On the side there is a small pocket and some mesh (too small for a water bottle). The Kaiser 1 holds a single full sized cardboard case (so 6 half trays, 72 medium tanks!). The Kaiser 1 is well built with a very durable material. So far my case is not showing any wear. It has thoughtful details like a carrying strap and rubber protective bits on the bottom. One of the zippers on my case has an issue at one end but I can work around this by just zipping from one side. I’m not sure if it is a one off problem or due to poor quality zippers on the bag. Overall, I am a big fan of the Kaiser 1 case and the KR Multicase system. I like the modularity of the trays and cases. I like that they are fairly easily available. The price for the cases is quite reasonable overall. The trays do take more work than Battlefoam to fit your models but the cases are much more flexible overall. The soft foam provides great protection for your models and the cardboard cases are durable enough to protect them (but are not quite as tough as a hard plastic case like Games Workshop ones). Final note: Looking on the KR Multicase website I can't seem to find the exact bag I have. The current Kaiser 1 does not have the pockets on the front. Where are you ordering the cases from? And can you just buy the boxes with the foam trays in them? I have just ordered.them directly from kr as they include shipping from their website. You can get the card boxes with trays. I have 3 I swap in and out of my case.